Dinosaur Corporation is pleased to share with you the collection of original oil paintings showing the "Evolution of Earth Science". The amazing visual experience from Precambrian era (4.6 billion years ago) to Late Pleistocene epoch 10,000 years ago) by paleo-artist Josef Moravec. Unique quality reproduction of original oil paintings on HD Aluminum metal dynamic artistic prints where specialty dyes are fused into coated aluminum panels offering brilliant natural colors and sustainable art preservation. Made in USA. Prepare to embark on a visual journey across billions of years in the evolution of earth science. 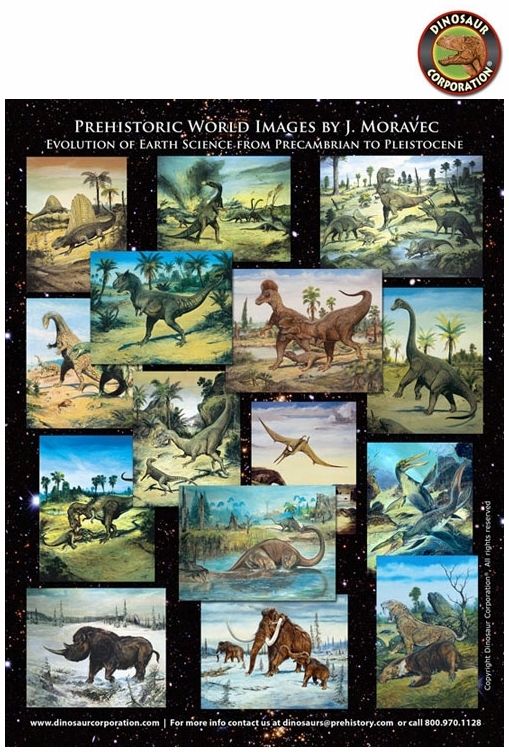 From Precambrian 4.6 billion years ago to Late Pleistocene Epoch 10,000 years ago, Dinosaur exhibit includes 40 HD Aluminum Framed Panels showing land and sea creatures, dinosaurs and ice age animals from all 12 prehistoric periods. Prehistoric trilobites from Cambrian and Ordovician, sharks from Devonian, Permian and Jurassic reptiles, Mesozoic dinosaurs such as Tyrannosaurus rex, Triceratops, Parasaurolophus, Tarbosaurus, Ceratosaurus, Stegosaurus, Anatosaurus, Carnotaurus, Dilophosaurus, Diplodocus, Brachiosaurus, Allosauruses and prehistoric animals such as Indricotherium, Brontotherium-Titanothere from Oligocene epoch, Deinothere from Miocene epoch, Woolly Mammoth, Cave Bear, Woolly Rhino-Coleodonta, Columbian Mammoth, American Lion and Saber Tooth Cat from Pleistocene epoch. * Original Medium: Oil on Canvas. * 40 oil paintings in reproduction on HD Aluminum Metallic Framed Prints. * Rich vibrant colors give visitors an ultra-modern "Art Gallery" look. * Exhibit size: 320 linear ft / 480 sq. ft.
* Venue length: 3 month (additional months negotiable). * Rental for Permanent Exhibits. * Venue length: 365 days. "THE EVOLUTION OF EARTH SCIENCE"
The exhibit is available to museums, schools, discovery centers and libraries in US and Canada in 2018 and beyond. Available at wholesale prices: dinosaur toys, dino dig kits, T-shirts, models, toys, woodcraft puzzles, fossil replicas, teeth, claws to choose from to fill up your gift store during the exhibit.